Destiny Helpers is a generous community of people helping each other fulfill destinies. We provide a free and collaborative platform to help you share and fulfill your God-given assignment. 1. 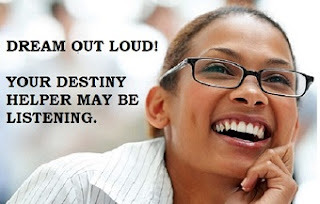 Join Destiny Helpers group. Membership is free and by invitation/recommendation from a friend. 2. Then, post any project, assignment, or dream that you feel the group can help you accomplish. 3. Finally, be on the lookout for any way that you may help fulfill another person’s dream. We may be scattered all over the world, but our needs are as legitimate as they are varied. It is often true that one or more of us may well have the word of advice, connection, or support that another member needs to fulfill a dream or achieve a goal. As we know too well, the person at the receiving end today may be the giver or helper tomorrow. Life is in phases. In fact, as we grow or advance in life, our assignments may change or grow as well, necessitating new opportunities and challenges. We will always need a community of destiny helpers. 1. Humility - to ask for help when we need it. 3. Discretion - the discretion to treat aspirations and needs shared in the platform with utmost respect and privacy. 4. Faith. While God may use people to assist us along the way, we all know that He alone is our source and sustainer. Our hope and trust will always rest squarely and completely in Him. After all, “He who did not spare His own Son, but delivered Him up for us all, how shall He not with Him also freely give us all things?” (Romans 8:32, MEV). If you think that there might be a utility for such a platform of destiny helpers, feel free to join and invite selected friends of yours to join as well. • Be sure that you personally know each person you invite. Keeping the integrity of this group intact is key to our mission. • Invite people from different spheres of life – pastors, professors, professionals, businesspersons, stay-at-home-moms, etc. • While this is not merely a ‘Christian’ group, it will be guided by a Judeo-Christian worldview. Be sure that those being invited are in agreement.